Over the last few years the Costa Daurada, located in the province of Tarragona south of Barcelona on Spain’s eastern coast, has become increasingly popular with road cyclists. As the sport continues to surge in popularity and cyclists are looking for new destinations to explore, the Costa Daurada is following in the footsteps of Majorca and diversifying from its sun and sea reputation, promoting itself as a sports and outdoor destination and encouraging visitors outside of the traditional summer season from June to September. 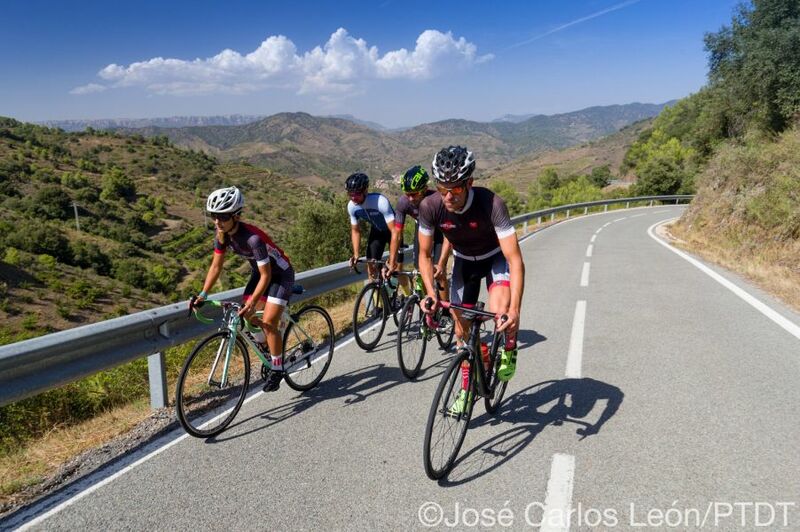 The area is well placed to see a boom in cycling tourism in the next few years thanks to its quiet country roads, pleasant climate, excellent food and wine and accessibility – Reus airport is just 15 minutes from the coastal towns of Cambrils and Salou, and Barcelona airport is 1 hour up the road. Many pro teams train have started training here and hotels have been quick to catch on and offer facilities like secure bike storage and maintenance areas, as well as in some cases good quality bike hire. Local guides are also available should you want some local knowledge and a support vehicle. While at first glance when you arrive you may not see the appeal for cyclists, head to the hills inland and you will find well-paved roads virtually free of traffic, connecting small Catalan villages to each other and the rest of the world. The terrain offers some (fairly) gentle hill climbs with steady gradients of up to around 6% to a maximum of 1,000m above sea level and there are a variety of routes to the west and east of Tarragona, approximately 200km to explore in total. One of the highlights has to be the stunning Priorat area to the west, home to the Montsant Natural Park. Pedal past terraced vineyards, picturesque villages, and the majestic Serra de Montsant mountain range with some occasional, yet welcome, shade from the surrounding pine forests. For a break head towards the Cartoixa d’Escaladei a Carthusian monastery, open to visitors Tuesday-Sunday, one of the most important historical sites in the area; followed by a visit to the Scala Dei wine cellars to try the award-winning local wines, like the superb Cartoixa. For lunch make your way to the Hostal Sport in Falset for the 3-course menu del día and another glass of local red to round off your day. Catalonia is an autonomous community with its own language and distinct traditions. You will hear much more Catalan than Castilian Spanish spoken during your stay as the language is now flourishing after being banned during the Franco years. At every village you come to during your rides, you will notice yellow ribbons wrapped around everything from trees to balconies to signposts and even painted on the roads. This is a display of solidarity with Catalan politicians who in 2017 were charged and in some cases imprisoned, following the referendum on the region’s political independence from Spain and subsequent unilateral declaration of independence. A good place to base yourself during your stay is in the seaside towns of Cambrils and Salou at one of the many bike hotels and resorts along the coast. Cambrils in particular is famous for its cuisine and highly regarded restaurants and both offer plenty to do during your time out of the saddle. Those travelling with their families will enjoy the large sandy beaches and the nearby PortAventura theme park. Tarragona with its well-preserved Roman ruins, imposing cathedral and lively bars and restaurants is a wonderful place to go for a wander in the evening; you can visit the Roman foundations of the town and get a real sense of the Roman city that lies below the modern costal port and surfaces at random points throughout the centre. Another underrated gem is the city of Reus. Many people arrive at the airport and leave for the coast but this city, birthplace of celebrated Catalan architect Antoni Gaudi, is a fascinating place to explore. Home to the ‘Modernist route’ there is a wealth of modernist architecture to discover, the highlight being the wonderful Casa Navas – a house designed and built for a family of wealthy local merchants overlooking the market square. You can only visit by private guided tour, which you can book at the tourist information office opposite. If you have any questions on cycling holiday itineraries in the Costa Daurada, just contact us. You can also check out our new cycling package, ideal for small groups of 8 or more including airport transfers, accommodation, and 5 guided rides. Any comments or suggestions? We’d love to hear from you below!